Paulus Antonius van Baer was born on October 22nd, 1788 in the city of Eindhoven, the Netherlands. After having received primary and secondary education he went to Herlaer, the major seminary of the apostolic vicariate of’s Hertogenbosch at the time. Soon after his ordination to the priesthood he was appointed as curate at Asten and Schijndel. In 1821 he was appointed parish priest of Den Dungen and in 1826 he was appointed to the parish of Waalwijk. In January 1836 P.A. van Baer was appointed parish priest and Dean of the St Servaas church in Maastricht by Vicar Apostolic Den Dubbelden. In February of that same year he was inaugurated as commissioner general of the city and district. From 1833 – 1840 Maastricht was put under the jurisdiction of the Apostolic Vicariate of ‘sHertogenbosch. (See: Ecclesiastical administrative structure of Maastricht in the 19th century 1.3). 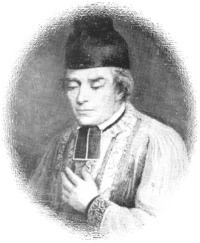 In his function as parish priest and Dean he assisted Elisabeth Gruyters in founding her Congregation, which was called as Sisters of St Vincent de Paul. His wisdom, prudence, and beneficial hand were a great help in realizing the founding of the Congregation. The first convent at Lenculen Street, founded on February 12th, 1837 and then a house at the Vrijthof (1840), and the former deanery which at this moment the Mother house (1845) were bought P.A. van Baer for the convent. With care he composed the Rules and Statutes and in order to obtain clerical approval he kept in touch with the Bishop of Roermond and with Rome. From later historiography it appears that Rome objected to this title. Mother Elisabeth and Dean van Baer were put to the choice either of associating with the Congregation founded by St Vincent de Paul, or accept St Charles Borromeo as Patron Saints. They have chosen the latter becomes clear from the Constitutions written by Elisabeth herself, for their beginning reads like this: Constitutions or a Rule of conduct for the Convent of the Sister under the title of St Charles Borromeo and the invocation of St Vincent de Paul at Maastricht. Elisabeth writes with great esteem about Dean P.A. van Baer and even calls him ‘founder and director of our convent’ on one occasion. P.A. van Baer died on January 28th, 1855. He was buried in the churchyard of the parish of Wolder, now part of Greater Maastricht.